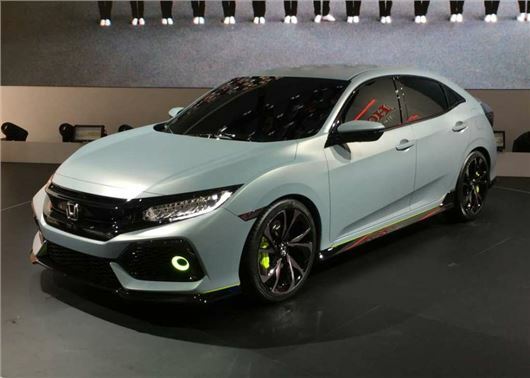 The next-gen Honda Civic has been unveiled in prototype form at the Geneva Motor Show 2016. The British-built hatchback gets an aggressive new look, more interior space and better fuel economy, with fresh 1.0-litre and 1.5-litre petrol engines. The new Honda Civic is expected to be reach the UK in early-2017. The tenth-gen Honda Civic will be 30mm wider and 130mm longer than the current model, with shorter overhangs and an aggressive new look. LED headlights and daytime running lights dominate the front, while a sculpted rear end with C-shaped LED light and an integrated aerodynamic spoiler complete the sporty redesign. Inside the Civic will be more spacious than before, with significant improvements to head and leg room in the front and back. Boot space is also expected to be increased, although Honda hasn't released any official specifications and the Geneva concept car was locked and off limits for all members of the press. Under the bonnet the Honda hatchback will be offered with all-new 1.0-litre and 1.5-litre petrol engines, along with a revised version of the existing 1.6-litre diesel. There’s no details on fuel economy or emissions yet, but expect the 1.0-litre unit to boast 70mpg.